Note from The Black Vault. It is reported that the following case is a hoax. The sources are below and they are archived here for reference. 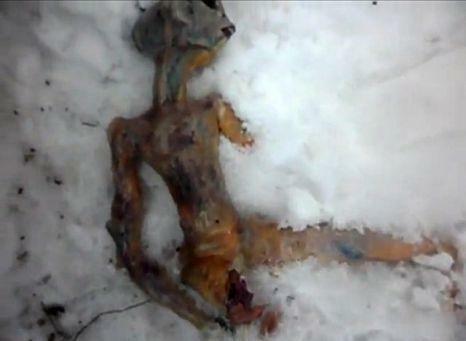 The lifeless ‘body’ was supposedly discovered lying in snow in the Irkutsk region of southern Siberia following reports of a UFO crash last month. The ‘extra-terrestrial’ appears to have suffered horrific injuries — including the loss of one limb. Shocked villagers had told of seeing a pink and blue glowing object hurtling towards the town before the ‘alien’ was found. The bizarre reports were taken so seriously, they were investigated by the country’s Emergencies Ministry staff. The tiny “dead alien” is just skin from chicken filled withbread, reports the website 7d.org.ua. Police questioned the men who claimed to have found the “body” and they allegedly confessed to creating it themselves.